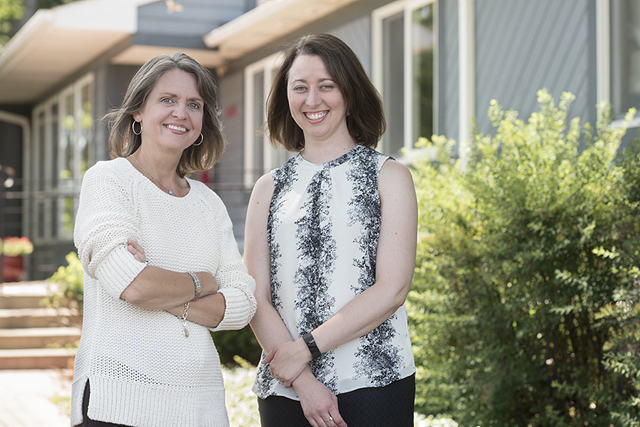 (Photo by Darren Andrew Weimert) YSB director of operations Christine Bishop (right) will move into the CEO’s chair when Andrea Fisher (left) retires within the next year. Fisher has been CEO since 2009. Former YSB client Valerie Freeman with daughters Daphne, 7, and Melody, 3. First, young Valerie Freeman’s parents got divorced. Then her house burned down, and her mother’s boyfriend abused her. The final straw came at age 13, when her mother “freaked out” and hit her over and over again. Barefoot and bleeding, Freeman ran from her Park Forest home to a neighborhood church, where concerned adults called the police. She moved into the Centre County Youth Service Bureau’s Stormbreak group home for nine months, tried living with her father but ended up in a hospital because she was at risk of hurting herself, and returned to the group home for nine more months. At YSB, she loved the “predictability” of life governed by a rule book that set out what was expected of both staff and residents. Although Freeman moved out of Stormbreak and in with a foster family for the rest of high school, she credits YSB for giving her “faith in the system to solve societal problems.” Financial aid made it possible for her to study sociology at Penn State; unfortunately, she didn’t realize that she was eligible for food assistance and ended up dropping out shortly before graduation, unable to pay all her bills. Freeman got married, had a baby, got divorced, finished her bachelor’s degree, and had another baby. 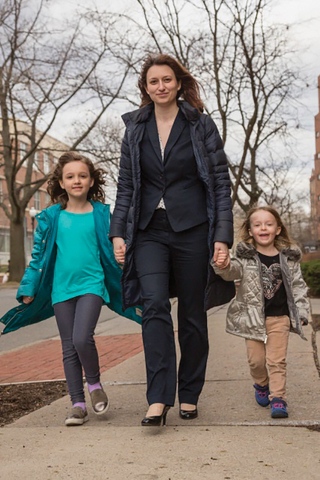 While working an AmeriCorps job at a nonprofit organization, she decided she wanted to do something “bigger.” Now, at age 30, she lives in New Jersey with her two young daughters, Daphne and Melody, and is studying law at Seton Hall University. Since 1968, YSB has been helping young members of the community like Freeman to turn their lives around. This year, the organization celebrates 50 years of growth and of continuously changing and creating programs to meet Centre County’s evolving needs. From his seat on the bench of the Centre County Court of Common Pleas back in the 1960s, Judge R. Paul Campbell often presided over cases where a local teen was accused of committing a minor crime. He decided he wanted a better option than sending the teen into the juvenile justice system far from family in a large city. So he gathered concerned members of the Centre County community and founded the Youth Service Bureau, with the goal of keeping kids close to home while helping them learn to make better decisions for the future. Norma Keller became involved with YSB as a volunteer mentor in 1972 while a graduate student at Penn State; the next year she interned at YSB and then was hired for what ended up being a 36-year career, with her retiring as CEO in 2009. According to Keller, YSB’s mentoring program predated the national Big Brothers Big Sisters program, with volunteer “supervisors” appointed by the local court to help youth learn to avoid future trouble with the law. In the early 1970s, researchers in a national study declared that more community-based services were needed to help prevent kids from entering the criminal justice system, and federal funding became available. “Because we already had a head start and because we did it well, we were one of the first in line for funding after that study,” Keller says. Other Pennsylvania communities soon asked YSB for advice in starting their own programs. Fifty years after the organization’s founding, YSB’s annual budget has grown to more than $4 million, three-fourths of which comes from local, state, and federal government grants and contracts. United Way and private contributions account for more than $500,000. In addition to major fundraising events and individual gifts, YSB also benefits from several endowments at the Centre Foundation, which also was founded by Campbell. Prevention programs strive to help kids fulfill their potential by proactively heading off problems such as drug and alcohol abuse. These programs include prevention education in schools and community groups, mobile outreach teams who visit kids in local neighborhoods, youth centers in Bellefonte and Snow Shoe, and the Big Brothers Big Sisters mentoring program. Family services are resources for kids and families who need help developing a safe, healthy family environment. YSB educators work one-on-one with parents to teach parenting skills, assess children’s developmental abilities, and help parents cope with stress. The Family Group Decision Making program brings extended families together to make decisions benefiting a child in crisis, and Reunification Services works to resolve issues so children temporarily separated from their families can return home or gain a new permanent home with other family members or adoptive parents. Residential programs provide a temporary or long-term home for youth ages 12 to 21 who lack a family residence where they feel safe. Among these programs are the Stormbreak group home for adolescent girls, Burrowes Street Youth Haven temporary shelter for runaway or homeless youth, and an independent-living program that helps youth ages 16 to 21 learn the life skills needed to live on their own as adults. Inspired by Judge Campbell’s initiative when he founded YSB in 1968, staff members and volunteers continually assess needs among local youth and look for creative, evidence-based ways of meeting those needs, says Andrea Fisher, who took the helm of the agency when Keller retired in 2009. For example, when staff realized that children were being sent to foster care because of unsanitary and cluttered conditions at home, they launched the DeClutter program to help parents clean and organize so it would be safe for kids to return home. After police talked with YSB about neighborhoods with a high incidence of domestic 9-1-1 calls, Fisher adds, YSB created mobile outreach teams to educate and build supportive relationships with kids on their own turf in those neighborhoods. Keller recalls that some new programs were born out of the “outstanding” relationship between YSB and local youth-related governmental agencies. “They would come to us and say, ‘Could you create an in-home program to help parents prevent child abuse,’ and we did,” she says. Another adaptation to changing needs, Keller says, was the evolution of what is now the Stormbreak shelter. A nationwide teen runaway problem in in the ’70s led to federal funding of the shelter for more than a dozen years. As the number of runaways dropped in Centre County, YSB shifted the shelter’s focus to group-home services for girls who faced various challenges. More recently, as some of Centre County’s towns have grown larger, the organization has added an urban on-the-street outreach program, connecting to kids in downtown State College and Bellefonte with giveaways and written materials. Fisher says that YSB also takes advantage of new technology, connecting to youth and families through the latest social media. Half a century after Judge Campbell and a small cadre of volunteers launched YSB, the organization has grown and evolved to meet the needs of the local community. Still, YSB’s core mission remains the same: to provide children and youth with opportunities for their best possible future. Tracey M. Dooms is a freelance writer in State College and a special projects editor for Town&Gown.